This is the action off a spanish sidelock that was recently brought in for service. I feel it nicely illustrates why you should have your gun regularly serviced. 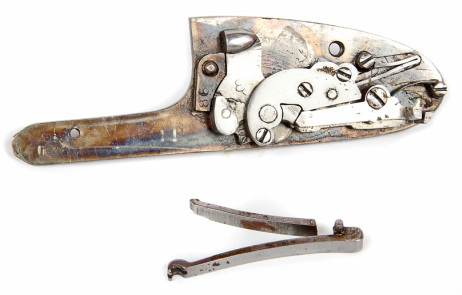 Here the internal parts show the rusting that is typical of a gun that has seen a couple of wet seasons without a service. If your gun gets a good soaking during the season there is nothing short of a full strip and service that will prevent it rusting. Shotguns are not weather proof, they are like vintage cars in that they rely on having a lot of attention to keep them working as they should. 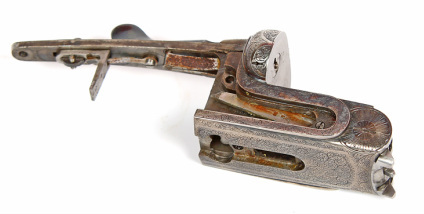 Yes, I know people who claim never to have any trouble form their unserviced gun, but they do all break eventually, and a well maintained gun is quicker and cheaper to repair then a rusting heap no matter how clean it looks for the outside. 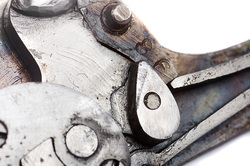 Other faults often become apparent during the service, another reason to get the gun serviced before you need it. Here we have an obvious fault of a broken main spring. So that is why this gun is misfiring on the right barrel. But there is another fault with this lock. Have a good look at that tumbler, just above the swivel pivot. Can't see it yet, I'll show you. This tumbler has a crack in it. 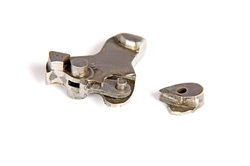 This can either be found during a service, and be dealt with as a routine job, or become an emergency breakage during a days shoot, because this is going to break, break soon, and probably cause damage to some other parts when it does. So that would be one shoot day shortened, and unless you can get it to a repair gunsmtih quickly maybe not just one day lost. Best we deal with it now. This doesn't look right either. The intercepting safety sear isn't engaging properly. The return spring is worn and needs replacing. So we have now found that the right main spring is broken, both tumblers are cracked, and the left intercepting safety sear return spring needs replacing. It's just as well this came in for service well before the start of the season. So how are we going to repair all these faults. Well, I will fit a new right main spring and left intercepting safety sear return spring made from a factory blank (no need to hand forge springs for this). The tumblers could be replaced with new ones, but I know that the customer wants to keep the costs down, and in this case I can tig weld the existing tumbler and make the tumbler stronger than new as there is space available to build up a reinforcing web at the weld site. I will update the site detailing the repair techniques used on this gun as this job progresses. To see the repaired tumbler click here.